When 64-year-old Lillie discovers that she has a half-brother in her biological family's home country of Ireland, it doesn't take much persuasion for her to make the leap over from Australia to visit him and find out more about her relatives. The change of scenery is exactly what she needs as the recent loss of her longtime husband and best friend is weighing heavy on her. With Lillie's arrival comes a breath of fresh air in the idyllic village of Redstone. She quickly befriends the locals, from a 15-year-old girl who is wise beyond her years to another newcomer to the village who's just opened a shop. During her visit she stays with her brother Seth and his wife Frankie and seeing the cracks in their marriage she subtlety tries to fix it, along with their barely habitable house, in an attempt to repay them for their kindness towards her. Opal's family is well known in the village. She has three handsome grown-up sons and a glamourous daughter who's making a career for herself in London. With her children no longer living at home she's glad of the company of her teenaged niece, Freya, who lives with Opal and her husband because the child's mother is unfit to care for her. But when daughter Meredith graces her family in Ireland with her presence once more, she's no longer the well-put together and confident woman that left Redstone, and the village and upbringing she'd been looking down on for so long suddenly become the one thing she wants most of all. Peggy's been wandering the country for years, unable to settle down anywhere, but in Redstone she sees a place she can call home. As she moves into the village she finally has the opportunity tto make her lifelong dream a reality as she opens a knitting shop. She works hard to make it a success and she unexpectedly finds love in the process, something she's never thought would have a part in her life. But Peggy carries a dark secret with her and just when she seems to have found true happiness it all comes crashing down on her. From a reader's point of view there are a lot of different story strands within the novel that do not come together until the very end. In the beginning this made it a little difficult to keep track of who's who, which was made only harder by the fact that I was reading the book in short chunks during my commute to and from work, but as I slowly became familiar with the various characters the frequent change is storylines couldn't happen quick enough as I kept wanting to know what was happening in the lives of for instance Opal and Peggy when I was reading about Lillie. The Honey Queen is a gentle but also compelling novel, with hidden intrigue as it's filled with interesting characters that have more depth than you realise from the first instance. They also feel very realistic as they are neither perfect nor one-dimensionally evil. And despite their flaws there's a lot of goodness within the hearts of the villagers, which makes you care for their individual journeys and wish they were your own neighbours and friends in real life and not just people you're reading about in a book. In fact, living in Redstone must be absolutely wonderful. The friendly community spirit, the eclectic independent shops and its picturesque surroundings make it a dream location for anyone to settle down in. 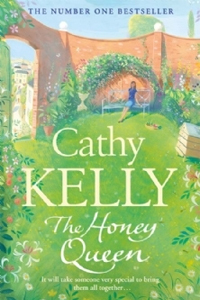 And I do hope that author Cathy Kelly will visit the village and its inhabitants again in the not to distant future as I'd love to read more about the ups and downs in the lives of these heartwarming and memorable characters.